Flying is an aviation magazine published since 1927 (original name Popular Aviation). It is read by pilots, aircraft owners, and aviation-oriented executives in business and general aviation markets worldwide. 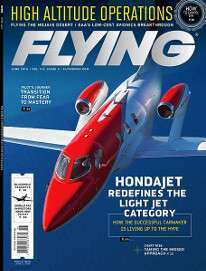 It has the largest paid subscription, newsstand, and international circulation of any U.S.-based aviation magazine, according to the publisher, Bonnier Corporation. They promote it as "The World's Most Widely Read Aviation Magazine." In June 2009 Hachette Filipacchi Media U.S. sold the publication to Bonnier Corporation, the U.S. division of the Swedish Bonnier Group, along with four other magazines: Popular Photography, Boating, Sound and Vision and American Photo. Flying magazine banner and index, February 1915, Vol. 4, No. 1. 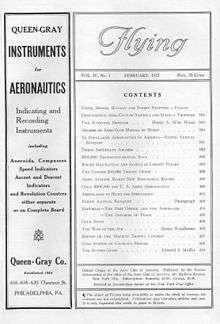 Flying was also the name of an unrelated magazine first published in February 1912 by the Flying Association, 297, Madison Ave., New York City as the "Official Organ of the Aero Club of America", measuring 30 cm. by 22 cm. and illustrated in black and white, including extensive advertising. Its volumes ran from February each year to the January issue of the following year. It was absorbed by the weekly magazine Aerial Age in 1922 after completion of the tenth volume, Feb. 1921–Jan. 1922. It included articles on a variety of subjects including manufacturers such as Glen Curtiss and Santos-Dumont, news items for the Aero Club of America and matters of military and naval defense concerning World War I. Flying had an unusual position regarding copyright, announcing in their banner that "The object of FLYING being principally to widen the circle of interest, the contents are not copyrighted. Publications may reproduce articles and cuts. It is only requested that credit be given to FLYING." ↑ "eCirc for Consumer Magazines". Alliance for Audited Media. December 31, 2012. Retrieved June 21, 2013. 1 2 "Flying Media Kit" (PDF). Retrieved 2010-01-06. ↑ "Bonnier Corp. Acquires Five Magazine Brands from Hachette Filipacchi Media U.S.". Retrieved 2010-01-06. ↑ "Flying magazine". The Naval Marine Archive. Retrieved 2013-01-26.